Save £50 off March, April and May breaks, simply use promo code SPR50 on booking. Do you require a property to rent? Look no further than our collection of 'flexilet' properties. Fancy a dog-friendly Norfolk retreat? Keep well-occupied with nature walks around Norfolk. Holidays spent with friends, family and loved ones, are the most special times of our lives. Whether they are booked way in advance or as a last-minute get-away, these times are highlights looked forward to by everyone and cherished for years to come. As a local, family-run company with 25 years of experience, we understand this. Our portfolio of 550+ properties, all fully graded, are located throughout the county in hand-picked locations. 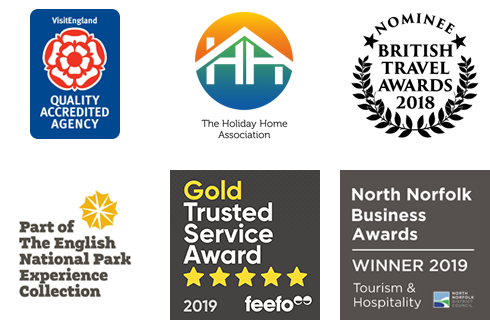 Our team are all local experts with a passion for the area and dedicated to making sure your experience, from start to finish, is a smooth and enjoyable one. So, no matter whether you book here via our website or by telephone with our friendly reservations team (based in the beautiful towns of Holt and Wells-next-the-Sea – not bad as work locations go! ), booking your property with us means you’re in safe hands. Even though we offer the largest portfolio of properties for you to choose from, we select and visit each and every property and only include those we would want to stay in ourselves. From expansive, red brick and flint barn conversions Norfolk is renowned for, to cosy romantic cottages for two, there’s an array of choice. Please use our excellent search facilities to help you find your cottage – from luxury abodes to savour, those that can be booked together for groups, as well as cottages ideal for your four-legged, waggy-tailed friend. Being local, we know Norfolk like the back of our hand, but often for visitors it’s a case of “where shall we stay”? You can rest assured that wherever you settle upon you’ll have a wonderful time. To assist you, you can also search our properties by area, where you’ll also find some of our top tips and favourite places. Our regular blog is also an excellent source of inspiration, as is our what's on pages where you can find details of Norfolk’s main events. So, pour a drink, settle into a comfy chair and start dreaming of your next holiday… in Norfolk. We look forward to welcoming you. "We have booked a number of cottages with Norfolk Country Cottages and have always had first class service." "First class, reliable, efficient, good choice of properties." "A first class customer service experience with the Norfolk Cottages team." "We often book with Norfolk Cottages and the service we have received is always excellent with clear information about properties and good directions."